Why Do We Watch James Bond Movies At Christmas? The James Bond films have been a television favorite during the holiday season for as long as I have been alive. I can credit the inception of my fascination with the series directly to Spike TV's 007 Days Of Christmas, which I would stay up watching all night before I was even a teenager. Yet, I've never really asked myself, how did this faux-tradition start? Initially it seems easily marketable to air the 23 films of the franchise during the time of the year all of the family gets together. There is more time to waste, and more people huddled around the 65" curved 3D debt-inducing 'experience' that is a talkie-box. The children become distracted by the exciting action, the men enjoy all the lovely women, and their wives get to fantasize about what it is like to be with a real man. The James Bond franchise became a cultural icon early in the 1960's, but made its Worldwide television premiere on September 17th, 1972. Confusingly, ABC chose to broadcast not the first, but third film in the series, Goldfinger during it's Sunday Night Programming. Unfortunately the network was notorious for censoring all of the films, often moving, editing, or even eliminating entire scenes and sequences in the interest of harsh censorship. Essentially, they were the Chinese North Korea (to be relevant) of television for a few decades. This proved disastrous to the reputation of the films when finally made available for home video entertainment systems. ABC continued to premiere the films during the months of September, October, and November, when viewership peaked. Eventually other networks were able to acquire the rights to the series, and it wasn't until HBO's premiere of Goldfinger in 1980 that a Bond film was shown on American television unedited. Bond made his television premiere in Britain in 1975, where it was done right. The films were televised in order, starting with Dr. No on ITV (when there were only three stations to choose from). ITV purchased the television rights to the first six films for £850,000 in 1974, a record sum at the time. It was initially denounced by many fans of the films, as they imagined the series would lose its appeal displayed in such a casual manner. It turned out to actually further grow the fan base of the films, with marathons running to build hype for the upcoming installment. In fact, Roger Moore's first Bond film Live And Let Die holds the record for most watched film of all time on UK Television at an audience of 23.5 million viewers when it premiered in 1980. It is ITV who can be credited first with making the attachment of James Bond marathons to the holiday season. The first four Roger Moore films were premiered on the channel the week of Christmas, and were instantly a hit with audiences. Realizing the success of this system, ABC and other channels soon followed with regular showings of the series during the last three months of the year. The eight most recent Bond releases since 1995 have hit theaters on dates in October, November, and December. With networks naturally wanting to run marathons of the Bond films around the release of the newest installment, they would also coincidentally run during the holiday season between Thanksgiving and Christmas. The two habits combined also make for a compelling marketing platform for home releases of the Bond films, as well as toys, collectors items, and other Bond franchise related items being hot commodities for holiday gifts. As far as holiday content, the James Bond series doesn't have too much to offer. On Her Majesty's Secret Service is set during Christmas time and features the song "Do You Know How Christmas Trees Are Grown? The film also heavily features some impressive ski scenery, as do The Spy Who Loved Me, For Your Eyes Only, the opening sequence for A View To A Kill, and The World Is Not Enough, which features the character Christmas Jones whose name, character, and the "actress" playing her all carry as a terrible running joke throughout the film. James Bond: "I was wrong about you. "Christmas Jones: "Yeah? How so? 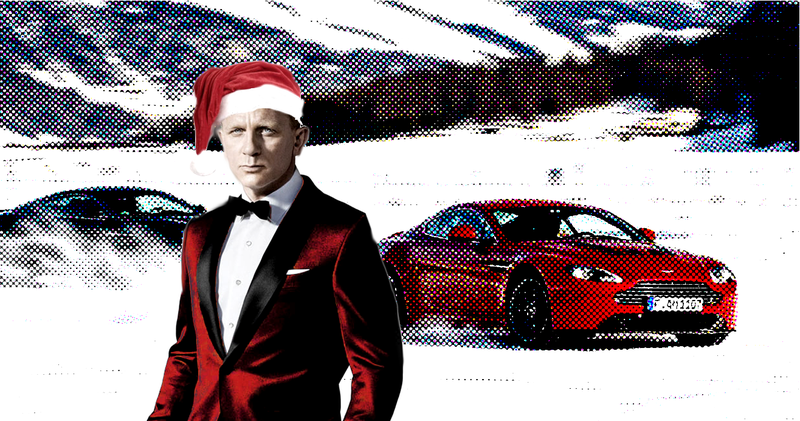 "James Bond: "I thought Christmas only comes once a year." Luckily kids are usually too innocent to get that double-entendre. Other films to include a decent amount of snow scenery are GoldenEye and the laughable car-to-cello-chase in The Living Daylights. Epix will be showing the series for the 24th and 25th, including the Everything Or Nothing documentary which I highly recommend (it's also free on Netflix). You can buy the entire series on iTunes here or the complete 23 Blu-Ray collection here. So when you and your family huddle around the television, quickly grow tired of the third showing of 24 Hours Of A Christmas Story, and switch to a Bond marathon, know that it is a tradition built on a combination of marketing, you and your family being home more to watch TV, coincidence, and very little actual Christmas content. With something for everyone to like, which Bond film is your favorite to watch as you quietly imagine vertically ejecting your relatives from the living room? Perhaps you'll be imagining yourself drifting through the snow in a 420-horse sleigh. Justin Westbrook is a 20-year-old who no longer is the General Manager of a Jimmy John's sub shop in North Carolina. He spends his spare time watching James Bond movies, trying to be serious about going to college, and is really into The West Wing right now. Photo credits go to Aston Martin and The 007 Dossier. I got my information from watching all of the James Bond movies, 007.info, shatterhand007.com, and MI6hq.com. Thanks for reading!